Many cookbooks contain more than just recipes. 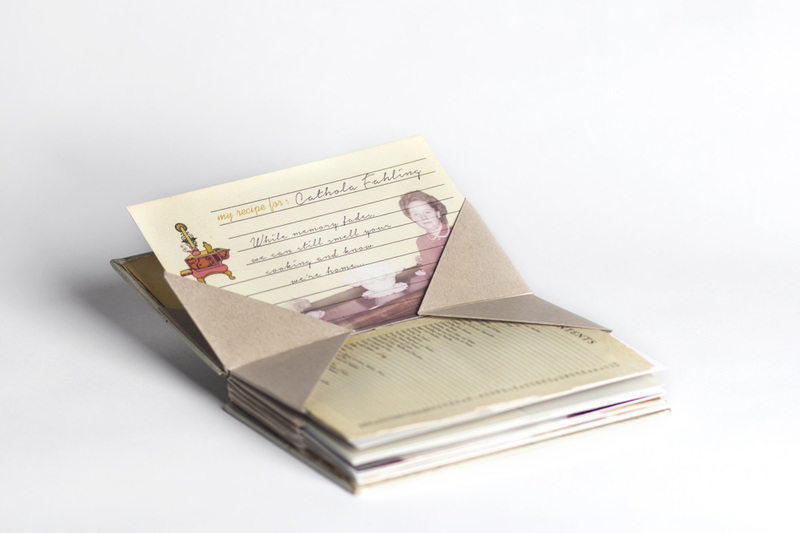 They could contain handwritten notes, personal recipes, tips and tricks to keeping up the household or guidelines to hosting a party. I found a cookbook amongst my grandmother’s collection that contained all of these things. 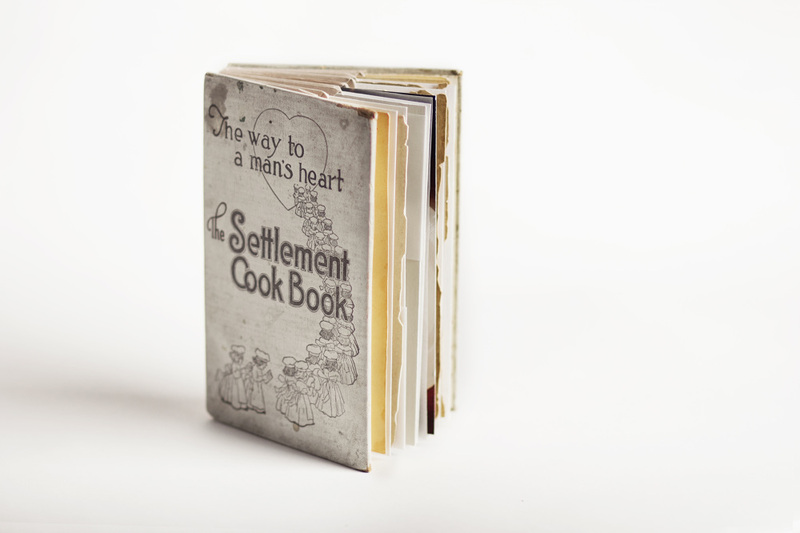 These cookbooks are scattered throughout her home, stuffed in cupboards, drawers, or boxes. With her loss of memory over the years, the reconstruction of this book focuses on how memories are kept in the physical form. “Household Rules” is a compilation of family images, recipes, rules and guidelines constructed to feel like a housewife’s personal cookbook. The pages contain fragmented memories that show the closeness of family and friends gathering around the table or preparing for a meal. The construction of this book encourages the viewer to remove, rearrange or insert information. Among the family photographs are handwritten recipes gathered by the original owner of the book to personalize the contents. Not only does the books visual imagery emulate memory and a sense of home but also the scent of coffee, cinnamon and vanilla stimulate our senses and transports the viewer back to the kitchen. 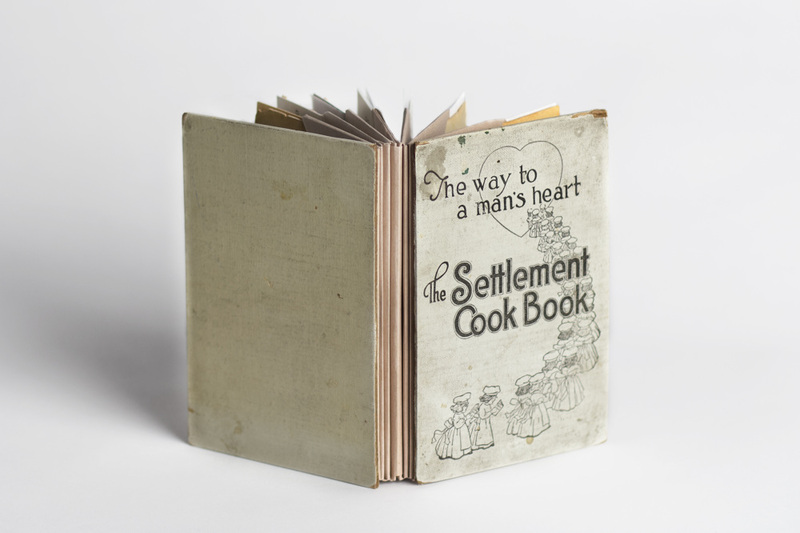 The cover of this book is most intriguing: “The Way to a Man’s Heart – The Settlement Cook Book”. The title implies that by following these rules and recipes one will please the men in their life. This work examines the importance of having the dinner table set perfectly; will he love you any less if a butter knife is missing or if you lick the mixing spoon? Phrases from the original cookbook are placed throughout this work and shown as handwritten notes. These words are stated so matter of fact, as if there is no other way. Juxtaposing those words with the imagery reinforces the idea that they are guidelines and out of fashion. This work exercises the idea of memory by interacting with the ideas of the past and evaluating them in the present.